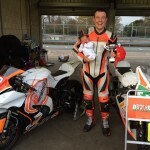 This was to be my first round with NG Roadracing having had to miss Brands Hatch due to the date falling on the imminent birth of my first child. The test day before the racing was dry and I chose to take out both the ZX10 and the Supertwin. Only minor suspension tweeks were needed on the ZX10, which Colin at 100% Suspension ironed out easily. The afternoon was my first outing on the Supertwin, although the Supertwin is the Minitwin I won the Minitwin and Pre Injection 700 championships on last year but now has uprated front suspension but is still only 72bhp. Therefore I felt I clicked with the Supertwin pretty easily and felt comfortable. Race day started off wet but by the time it came to my first race, the Pre Injection 700’s, there was a dry line appearing, but we still opted to run on full wets. The race was pretty uneventful and with my little power, I got stuck in traffic and only managed to finish 8th. Next up was the Open qualifying session on the ZX10, the track still wasn’t completely dry so we opted to run on a wet front and supercorsa rear. The session went really well with positions swapping and changing constantly, my times got quicker every lap and with the session only being 15 minutes I only managed to get 6 laps in, but still qualified 9th doing a lap time of a 1.52:01. 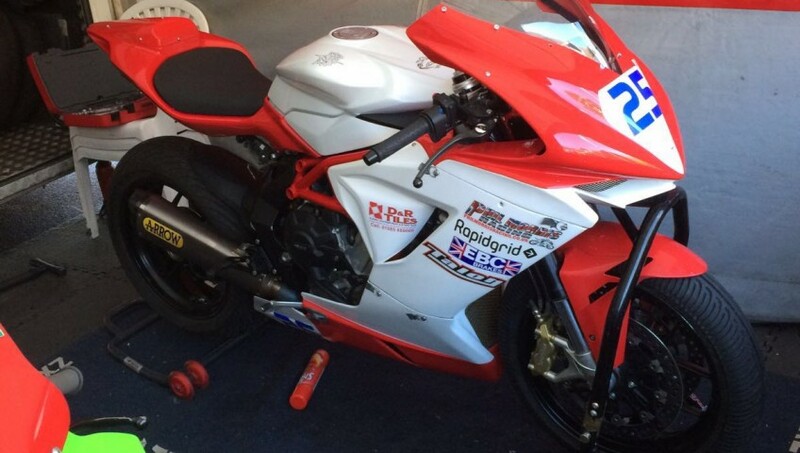 The next race was the Supertwin race which was run with the Sound of Thunder class, although run over a split grid. I was gridded 33rd but decided to get my head down early on to avoid getting caught up with slower traffic. I managed to get up to 12th overall and leading the Supertwin class by 8 seconds but a red flag incident ended the race early. Pleased to have placed myself further up the grid for the championship race for the afternoon as I would start in 12th position. After lunch break it was back to the Pre Injection 700 class for the championship points race. As I finished 12th in the qualifying race overall, this was to be my starting grid position. This was a very frustrating race as my Supertwin only has 72bhp and my competitors were running well over 90bhp, therefore I struggled to stay with them on the straights which meant I couldn’t over take in the corners. I did, however manage to finish the race in 5th position which meant points were scored. Back to my ZX10 next for the Open race, due to a bad start I lost a few places but ended up in a 5 way battle covering 8th to 12th position. The race was good fun due to the swapping and changing of places and I finished the race in 11th position. I was disappointed that I didn’t manage a top 10 finish but still pleased with the progress I’ve made with the ZX10 this year so far. Last race of the day was the Supertwin race where I was gridded 12th due to the mixed grid of Sound of Thunder bikes and Supertwins. I set off with the hope that I could get a tow off the Sound of Thunder bikes, the majority of the race I was running on my own and quite uneventful. I finished the race first in class and 12th overall and finished the race 2.5 seconds ahead of the next Supertwin. 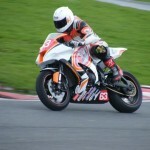 Overall the weekend went really well, pleased with the Supertwin win and the progress made with the ZX10. NP Motorcycles, Morris Lubricants, 100% Suspension, Crossing Garage, Tim Gittoes Agricultural Parts, NF Moto Leathers, Phil Morris Racing, The Racefit Programme and Melted Knee Sliders. Cadwell Park is the next meeting on the 10th & 11th May 2014, come say hello if your in the paddock and again if anyone would be interested in helping us out financially, please let me know.